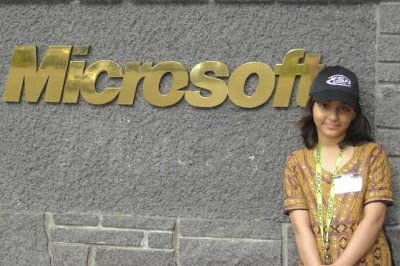 The World's Youngest Microsoft Certified Professional (MCP), Arfa Karim from Pakistan has passed away and lost the battle of life at the age of sixteen (16), after remaining admitted at Combined Military Hospital (CMH), Lahore Pakistan on Saturday Night (14-Jan-2012), she breathed her last after being in coma for over 26 days at CMH Lahore (Pakistan). Arfa Karim had earned the Microsoft Certification at the age of Nine (9) and she died at the age of sixteen (16). Arifa Karim remained in intensive care at Combined Military Hospital (CMH), Lahore after suffering an epileptic seizure and cardiac arrest a few weeks ago that caused severe heart and brain damage. This ultimately led to a heart attack. She had been on life support. Arfa Karim suffered cardiac arrest on December 22, and had been under treatment at CMH since. Microsoft had also arranged a team which was following her case closely along with Pakistani doctors. After battling for life for 26 days, one of Pakistan's brightest talent left this world for good. Arfa Karim was born in 1995 and she achieved the honor of World’s Youngest Microsoft Certified Professional when she was only 9 years old in 2004. Bill Gates, the Chairman of Microsoft, invited Arfa to visit the Microsoft Headquarters in the USA in the age of 10 only. Arfa Karim was also certified for flying a plane at a flying club in Dubai at the age of 10. Arfa was also honored by the Pakistan Government for the Fatima Jinnah Gold Medal in the field of Science and Technology and she had also got the Youth Award in 2005 from Pakistan Government and Arfa has also won the Presidential Award for Pride of Performance. Pakistan and World has lost the talented girl and May her soul Rest in Peace (R.I.P.). Her funeral will be offered in native city Faisalabad, Pakistan.